Why Swans Will Win ? Home » AFL » Why Swans Will Win ? Swans fans will be full of confidence following their win last week but for those who are still second guessing their side, here is 5 reason why they will win the flag on Saturday. 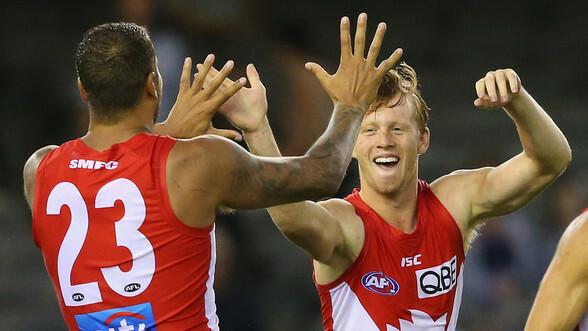 The quality of the Swans midfield was on display for all to see at the Brownlow medal, with Luke Parker and Daniel Hannebery polling 47 votes between them, while Josh Kennedy and Tom Mitchell also hit double figures. Then you have an All-Australian like Kieren Jack, plus Jake Lloyd averaging 25 touches a game, and the next superstar of the game Isaac Heeney starting to make his presence felt in there. Sydney has conceded 68 points per game this year, the best defensive performance since St Kilda in 2009. Dane Rampe was anointed All-Australian for his work across half-back, both one-one-one and when running and releasing. The Swans pressure opposition midfields to ensure the ball goes in high and wide, enabling the likes of Rampe, Heath Grundy and Callum Mills to drop off their men to create outnumber situations. The Swans averaged 101 points across the home and away rounds, while the Bulldogs could only average 84. Lance Franklin is on track for his second best goal return in a season, and the Swans have had a league high 15 players hit double figures for goals across the season. They have kicked 15 and 18 goals in their last two finals. The Swans go into this game with a minimum of 12 players with previous grand final experience, with over 20 grand finals between them. The Bulldogs will have one player at best to have played on the grand final stage. This experience of the senior players will prove invaluable for the Sydney youngsters, to absorb their lessons and it should mean the Swans find their feet earlier on the day. It’s not often a side can finish in the top four two years in a row, yet still walk away with the two best players in subsequent drafts. But the Swans have done exactly this with one of those players being arguably the man of the finals in Isaac Heeney, who has taken his game to the next level as inside mid and creative forward. He may be joined by Callum Mills if he has overcome his hamstring injury.